A creamy blend of spinach, shallots, parmesan cheese, and Boursin Light makes a rich and flavorful side dish. A low fat version of a steakhouse favorite. Your family and friends will love this! I love this with steak, but this is also great with turkey meatloaf. Boursin Light can be found in the cheese section of most supermarkets. If you can’t find it, light cream cheese or Laughing Cow could work as a replacement. Leftovers can be frozen. A creamy blend of spinach, shallots, parmesan cheese, and Boursin Light makes a rich and flavorful side dish. A low fat version of a steakhouse favorite. In a large saute pan, melt butter. Add shallots and garlic and cook on medium about 5 minutes. Add flour to shallots, mix well and cook one more minute. Reduce heat to low and slowly add milk, whisking well. Add parmesan cheese, nutmeg, salt and pepper and mix well. Add boursin light and mix with until smooth. Add spinach and combine well with sauce, cook one minute, until heated through. Adjust salt and pepper if necessary. So easy to make and ever so delicious. Since I’m the only spinach eater in the house it’s nice to know that the recipe freezes well. And it’s mine, all mine. Thank you so much sharing this. lf you use fresh spinach, do you have to cook it first? Can this be made ahead and rewarmed prior to serving? Or kept in a crockpot to keep warm? Trying to bring for Thanksgiving side dish but there won’t be the space to cook it there. I think either way would be OK.
I’ve made a few of your recipes but this is the first one that has moved me to write a comment! I was feeling lazy so used regular spinach and Greek yogurt cream cheese, and left out the shallots and flour. Holy cow! The nutmeg really puts it over the top. Thank you, Gina! Once again, Gina, you have nailed another excellent recipe. As others lamented, I could not find Boursin Light so I used the original Boursin. I am not certain if it was the Boursin herbs, or the nutmeg; something made this recipe exceptional. During the past 15 months, I have retooled my food choices as part of my Get Healthy Campaign. 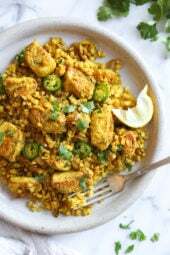 If your ears ever ring, it is because a chorus of us fans shares our special friend’s site with others who also want delicious, easy, and healthy food. Thank you, Gina: You are the Perfect Stranger. Can you make this in advance of something and freeze until the day of? Yikes! Your* family and friends! If I were to use fresh leaves, should i steam it first? Made this tonight to serve with grilled steak…wow!. I didn't think the fat free milk would "work", but it didn't break at all. I found the 16 oz bag of spinach at WalMart,,their own brand as well as BirdsEye. I didn't thaw it and I was afraid it would be watery but it was perfect. I hope there will be leftovers 'cause I'll grab a piece of baked chicken from the grocery store deli and that will be lunch. Bye-bye chicken place creamed spinach (you know the one) with all the fat/sodium etc. Is there a substitute for the flour to make it gluten free? I haven't tried this yet but I'm thinking it would be great to use for oysters rockerfeller which is what I'm really craving! this is great – and I actually find that it has plenty of sauce and seems a little more healthy with 2 frozen 16 oz bags of spinach….. I made this tonight and it was sooo yummy! 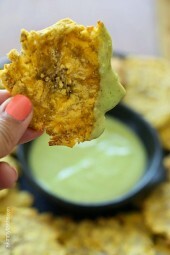 my husband who is picky about "healthier" versions of his favorite foods loved it!!! Instead of boursin light (could not find at my local market) I used allouette light which is the same idea. this is definitely one for keeps. Thank you!! We just made this but instead of the boursin and 1.5 cups of milk, we used some almond milk and half a package of silken tofu! It was definitely a success. I must say, this is one of the most delicious WW friendly dishes I have had to date! I choose to hold the parm and pour the whole thing into a baking dish, top with parm cheese and bake for 20 mins. Mmm mmm good! Thank you so much! How about stuffing some of this inside a hollowed out lightly roasted tomato??? 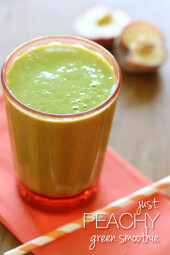 MMMMM and even healthier! Just amazing! Thanks for all that you do, Gina! Just made this recipe. Flavor was awesome, my husband and I both loved it. I didn't read the ingredients properly, though, and we used fresh spinach. It made it a bit soupy, but it was still really good. Next time, we'll try it with frozen and see if it changes anything. Thanks for a great recipe! I made this last night along with your leftover garlic mashed potato parties and both dishes were absolutely delicious! My husband was shocked when I told him they were light recipes. We ate them with small Filet mignons and your sides made it a truly delicious "steakhouse at home" dinner. Thank you for these amaziing recipes! I cant wait to try more! The family went crazy about this dish! Could not find light boursin, so we had to up the points with regular boursin. I love this side – I've made it twice already. But this time, I noticed a discrepancy in the serving size. At the beginning of the recipe, it says it serves 8 with 2/3 cup as the serving size. At the end of the recipe, it says it makes 6 1/2 c servings. The 6 servings seems more accurate based on my quantities, but I just wanted to check. Thanks again for your great recipes! This was also delicious! I made this for New Year's Day along with a roasted pork tenderloin. I used minced vidalia onion instead of shallots (didn't want another trip to the supermarket) and only used about half of the nutmeg (personal preference). Also I used 4 oz of neufchatel cheese mixed with a bit of garlic salt, onion powder and parsley, instead of Boursin Light- couldn't find it at my store. But it turned out terrific and I will definitely be making it again! Thank you Gina! I love creamed spinach, but have recently fell in love with kale. Knowing that kale is actually healthier than spinach, I have been trying to use it in many spinach recipes. I tried this last night and it was wonderful! I made this along with a small steak tonight and it was really good. Hubby loved it too. I think next time I might add a some red pepper flakes to give it a little kick! Anyone tried that?? Thanks Gina!! I made this tonight along with your chicken parmesan. The two went great together! Seriously, this was absolutely amazing and very easy to make. This will be in our regular rotation for both family and guests!!! I made this as a side for Thanksgiving dinner and it was a huge hit! The helping I squirreled away for myself to have in an omlette in the morning was even better the next day. This will be a staple at our table! Sure, fresh spinach always works in place of frozen. I'm making this as I type for Thanksgiving! Can this be done using fresh spinach?? Ok this is the best creamed spinach that I have ever tasted!! Hubby loved it too and agreed!! You ROCK Gina!! Oh MY was thi tasty! I had to use Laughing Cow. I used 4 wedges and it was DIVINE! I scooped some into a ramekin and broiled some cheese on top ( a la Spinach-artichoke dip) Delicious!!! Finally got around to posting your recipe (adapted). Really enjoyed it thanks! Gave you some blog luv. I have been on WW for several months and never thought I could have creamed anything!! This creamed spinach was delicious!! I had it with your turkey meat loaf and a tossed salad. Your recipes are wonderful, and I am so glad you have provided a pic with each one. I have recommended your site to many fellow WW members! Keep up the good work! We have made this twice in the last two weeks. The nutmeg really comes through and gives it that something special! Just delicious. I believe it was the store brand, they sell spinach in bags too, usually at the bottom of the freezer. If you can't find it, just use to boxes. Thanks for this delicious looking recipe. I was wondering what brand spinach you used that came in a bag and was 16 oz? I'm only familiar with the 10 oz. boxes. I'm hoping my grocery will carry this. Thanks, Gina! I made it the other night and it was very good- but I think you're right. It's not really a spinach dip. Thank you! Marianne, I don't think I would use a roux to make this into a dip. I'll try to post a spinach dip recipe soon. Wow, great job here. Awesome picture too! You should really consider submitting this to Recipe4Living's Tasty Thanksgiving Recipe Contest! It looks delicious! This might be a silly question, but will it work as a dip/spread, or only as a sidedish? I guess it's a matter of consistency… can I serve it with chunks of bread as an appetizer? Just made this last night and it was delish! Used light cream cheese instead of Boursin, as I had the cream cheese on hand. Very, very good! @Susie Bee- what a great idea, I'll have to try that! @chum- yes, onions would work instead of shallots! Glad you liked it!!! Yes, you can use any milk you have on hand, I'm not sure how to adjust the points per serving but I would put it in your recipe builder to see if it effecs the points. OMG, OMG, OMG. GINA! That was absolutely fantastic! I just made it. I changed a couple of small things (I used whole wheat pastry flour instead of all purpose flour, which I always use in white sauces and gravies). I used onions instead of shallots. And I thickened the white sauce on medium heat before adding the cheeses. BUT GOOD LORD GIRL, that was the best creamed spinach I've ever had — better than Peter Lugar's! Yum yum yum. Thanks for the recipe and for the clarification re: Boursin. Great timing on this post! 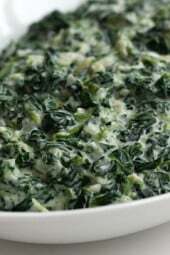 I am planning to have creamed spinach this week and hadn't found a recipe yet. This looks perfect – thank you!! Love Boursin Light. I use it with roasted red peppers to stuff chicken breasts. So tasty! 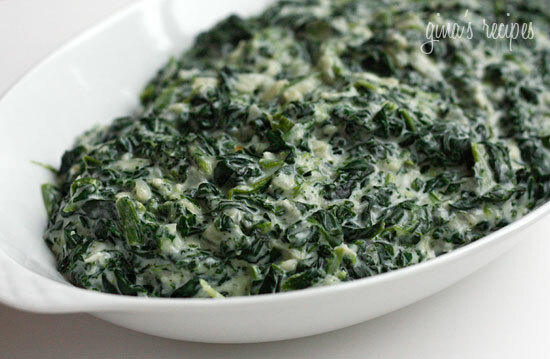 Can't wait to try this-creamed spinach is one of the hubby's favorite dishes which I avoid because of the fat. I've attached a link to Boursin light in the ingredient list, it's a soft, spreadable low fat garlic and herb cheese spread. You could also use Alouette light cheese instead. What is Boursin light? I'm from Sveden and never heard about it..
Look's great and i wan't to try it out! I love creamed spinach! I haven't had any in ages, and this really has me craving it! Gina, I can't wait to try this. I always get this side dish when I go to chop house. It's my favorite. Thanks for coming up with a lighter version. @Chum- It's garlic and herb, I should have mentioned that! It's nice to meet others with the same passion! It's a fun challenge. Quick question: Is there a plain Boursin light or just the garlic one I always see? BTW, love your blog. I've been reading it the past couple of weeks. You are like me, always trying to find a way to combine your love of cooking with eating healthier and sticking to WW. Thanks for sharing your results! Mmmmmmmm! This and taco stuff…Helloooo PARTY! Looks delicious, definitely trying it! came accross your blog through a host of differnt links. I love all the tempting photos, thank you so much for doing this blog! Oh, yum! To me this sounds delicious! Love this! This is totally bookmarked and will be made soon!